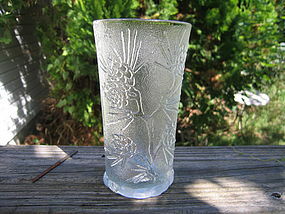 This the 6 1/2 inch flat ice tea glass in the Ponderosa Pine pattern by Tiara (Indiana Glass). Little, if any sign of use. There are 3 of the tumblers and matching available and priced individually. I need your zip code to calculate the postage.